Batchwood Hall Golf Club Captains Drive in for Charity. 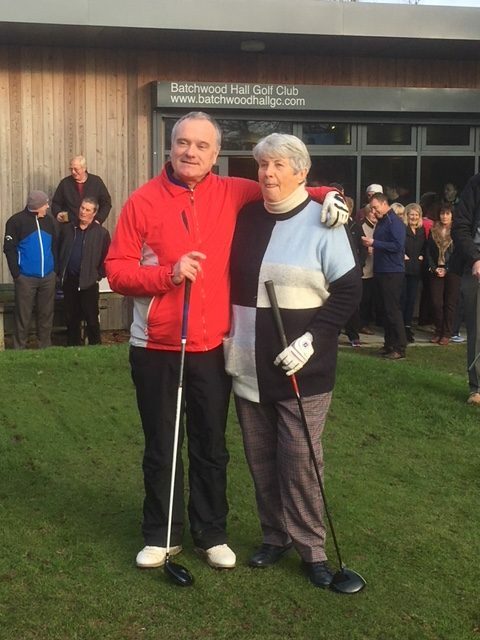 At Batchwood Hall Golf Club, on Saturday 6th January, at about 1:30pm, the skies stayed clear and the members turned out in force to welcome the new Captains for 2018, Club Captain David Piper and Lady Captain Janet Mountain. Loud music was played and the gathered crowd heckled in a vain effort to put them off. The annual ceremonial first drives were hit down the fourth fairway, or at least somewhere near the fairway, marking the official start of the new Captains’ year. David managed 167 yards and Janet, despite nursing an injured hand, drove the ball 117 yards. David nominated local charity Rennie Grove Hospice Care as his charity for the year, and Janet chose the RNLI as the beneficiary of her drive in. Because of the generosity of club members who bought guesses for the drive distances and bid for special auction items, over £650 pounds has been raised so far!